Are you looking for one tool to convert your M4V videos to MP4, for MP4 can be used on more kinds of video players than M4V. 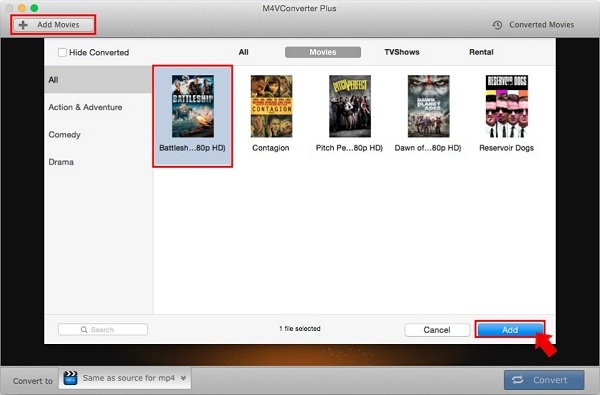 Even when the M4V movies are purchased or rented from iTunes Store, they have these or those limitations which give you a lot of inconveniences and troubles. It is necessary to convert M4V to MP4, and then you can enjoy the converted MP4 videos without any limitations and play them anytime and anywhere. 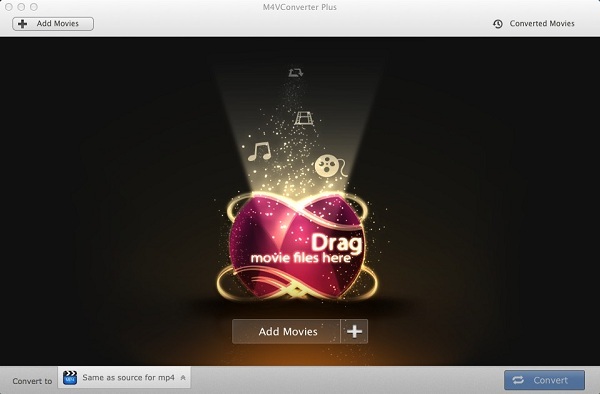 Here recommend you a powerful and simple M4V to MP4 Converter on Mac - M4V Converter Plus. Decrypt DRM from protected M4V videos including purchased movies, music videos, TV shows and movie rentals from iTunes Store. Convert DRM M4V to MP4, AVI, FLV, MOV, WMV, VOB, MPEG-1, MPEG-2, MP3, MP2, WMA, AAC, M4R, M4A, MP2 video and audio formats. 30+ Faster conversion speed than other similar videos formats. For one 2h HD movies, you need only about 30 minutes to finish the HD movie converting if you choose Same as source for MP4, MOV as the output format. Lossless quality output. Most HD & SD movies give users excellent view enjoyment. After conversion, you can also get lossless quality as the primary HD & SD movies. Note:Support output presets for Apple Devices including iPad Air, iPad 4 /3/2/1, iPad Mini2, iPad Mini, iPhone 6, iPhone 6 Plus, iPhone 5S, iPhone 5, Apple TV 3/2/1, iPod Touch 5/4/3/2/1, Apple Software including iMovie / ProRes, iDVD / ProRes, Final Cut Pro / ProRes, Final Cut Express / ProRes. Web Video (FLV, SWF, for YouTube / Flickr / Daily Motion), and other video and audio format (3GP, AVI, WMV, MPEG-1, MPEG-2, MP3, AAV, WMA, VOB, M4V, M4R, MP2). 1. 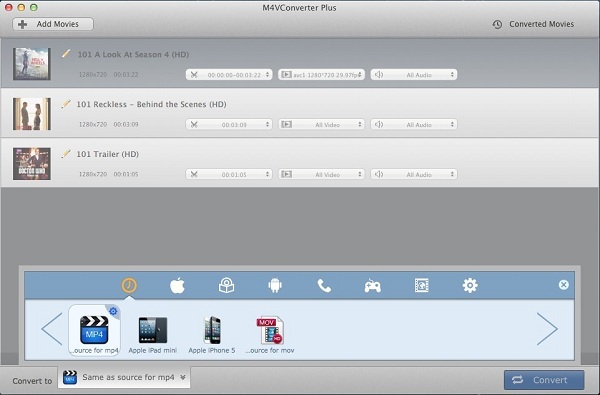 Through the download button download the newest version of M4V Converter Plus, install and run it. 2. Click Add Movies to add the videos. 3. As shown in the figure, you can set .mp4 as output format. 4. Now click the Convert button to start DRM M4V to MP4 conversion.